I am a freelance photographer and videographer from Bangalore. I specialize in Travel, Nature, Architecture and EDM event Photography. I am also into a documentary, corporate and events filming. The portfolio link above is a small testimonial on the genres of work i cater to. My work has been published in various national and international books and magazines including but not limited to coffee table books, in-flight magazines, etc. I have also been a part of many group photo exhibitions. I also conduct regular Photography, Videography and Post Processing workshops and Talks. I started photography as a hobby, but this hobby turned into a serious interest in 2006 when I started travel during my official breaks leading the hobby to take shape into a serious passion. 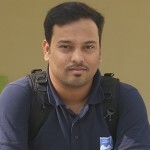 By profession, I am a software engineer and have a strong interest in photography and travel. To be equipped for the journey, I have adapted myself to the digital world by upgrading to DSLRs but continue to use my trustworthy Canon EOS300 Film SLR pretty frequently. The gear that accompanies in my journey is Mirrorless camera system by Panasonic comprising of Lumix GH4 and GH5 along with a variety of lenses, filters, and accessories. I process my images/videos on my Calibrated Apple Mac Book Pro using Adobe Creative Suite software. If there is anything more you want to know about my day-2-day life and also the “other side of me”, please follow me on twitter/facebook / google+ using the links below. I am also the co-founder of the India’s first and only dedicated landscape photography portal – Landscape Wizards and the co-admin of Creative Nature Photography.